Bob Murray, as a c. 1860 gentleman in summer undress. 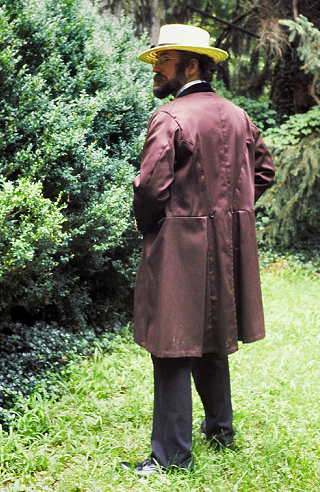 He's wearing a brown cotton twill frock coat, black cotton twill broadfall trousers, a linen shirt, and a fashionable vest in his own "Murray of Atholl" tartan, worsted lined with silk. 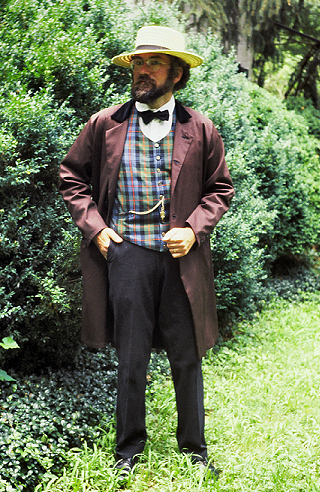 A black silk cravat, summer straw hat, and his gold watch and chain complete the outfit. 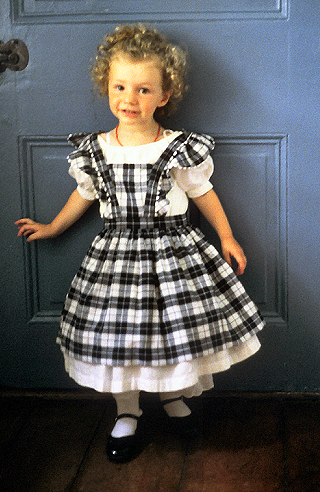 My daughter, aged 3, in her 1860 summer dress, a white cotton dimity back-fastening frock topped with a black and white plaid cotton pinafore apron. She wears a tiny strand of antique coral beads. My daughter, aged 5, in a fashionable child's outfit of c. 1862. 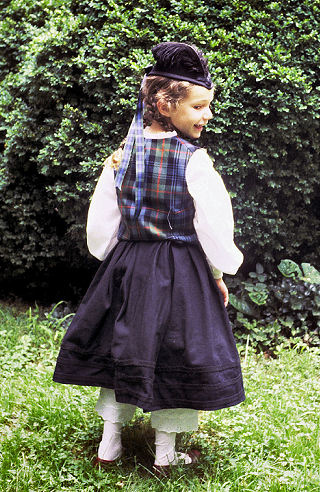 She wears a white cotton leno Garibaldi waist and a black cotton sateen skirt with braid trim, topped by a vest in the family tartan. 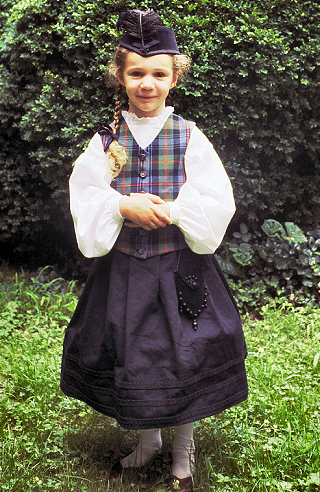 A black velvet "Scot's bonnet" with black plumes, and a black velvet "aumoniere" purse with beads and tassel are her stylish accessories. 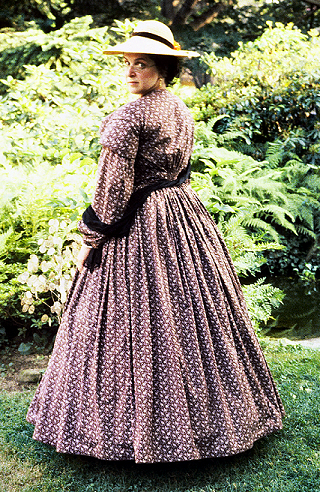 Sharon Burnston in a c. 1862 summer day dress, brown and white calico with a shirred fan-front bodice and bishop sleeves. 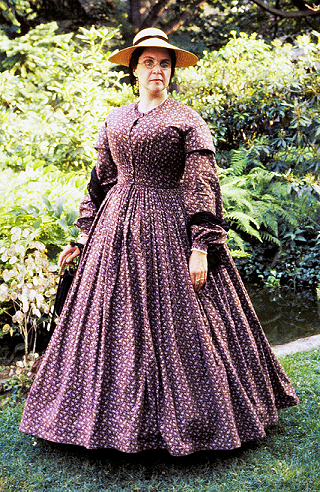 It features brown piping and narrow white lace at neck and wrists. 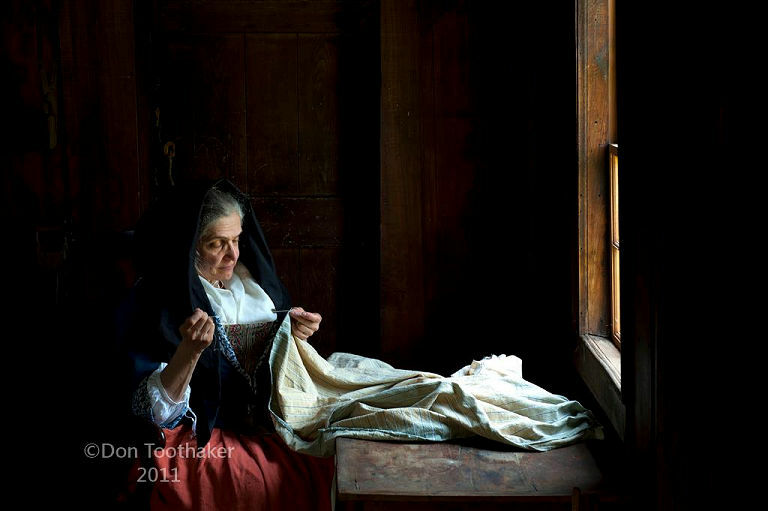 It is worn over a drill corset, bloomers, a camisole, a corded petticoat, hoop petticoat and flounced petticoat. She wears a Leghorn straw hat, a black "fascinator", and carries a black crocheted reticule trimmed with coal beads and a tassel. A 1912 summer walking suit of tan linen with abalone shell buttons, worn with a batiste shirtwaist trimmed with Schiffli embroidery and a straw hat with black grosgrain band. A 1914 tea-dance dress of aqua silk dupioni and ivory embroidered net, trimmed with tassels and pearl buttons, worn with a small rice straw hat suitable for dancing.